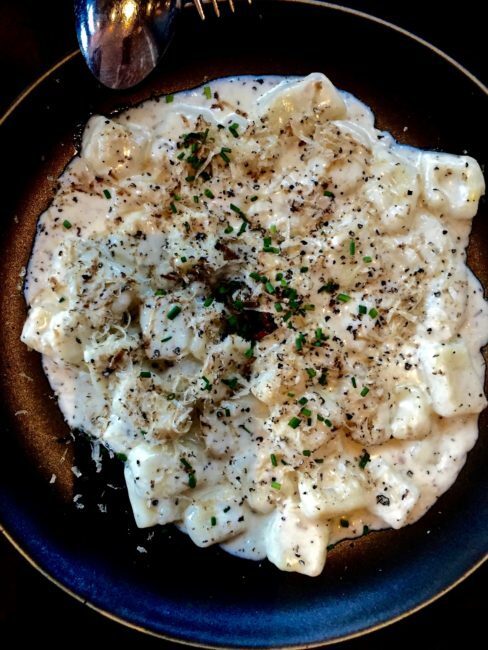 As anyone who has read Tom’s trip reports or Tom’s Dining Out knows, Tom loves his gnocchi. He has it everywhere we go. I would say gnocchi is one of his Top 5 favorite foods in the world. (below photo is from one of our visits to Officine Brera in Los Angeles). Before making, I watched a couple of videos on making gnocchi, and they all agreed that it is very important not to overwork the dough as it will result in gummy gnocchi. Kneading is good for bread but not so much for pasta. The trick is to fold and press gently. 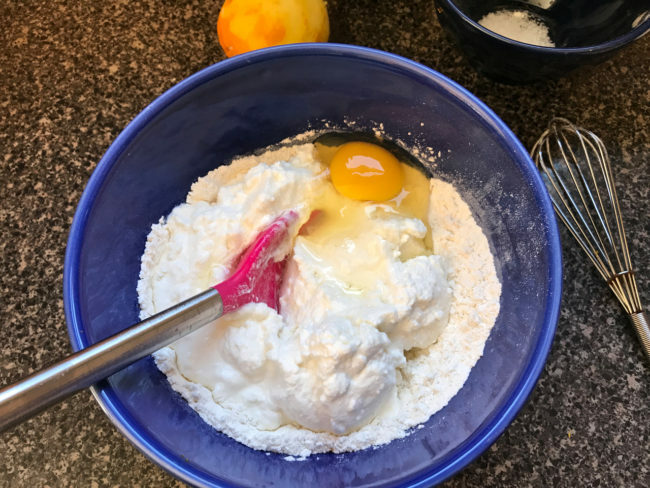 The dough came together really quickly in the bowl after which I turned it out on a lightly floured surface and shaped it into a round disc about one inch thick. I cut the disc into four pieces and then gently rolled it out into ropes about ½ inch thick. 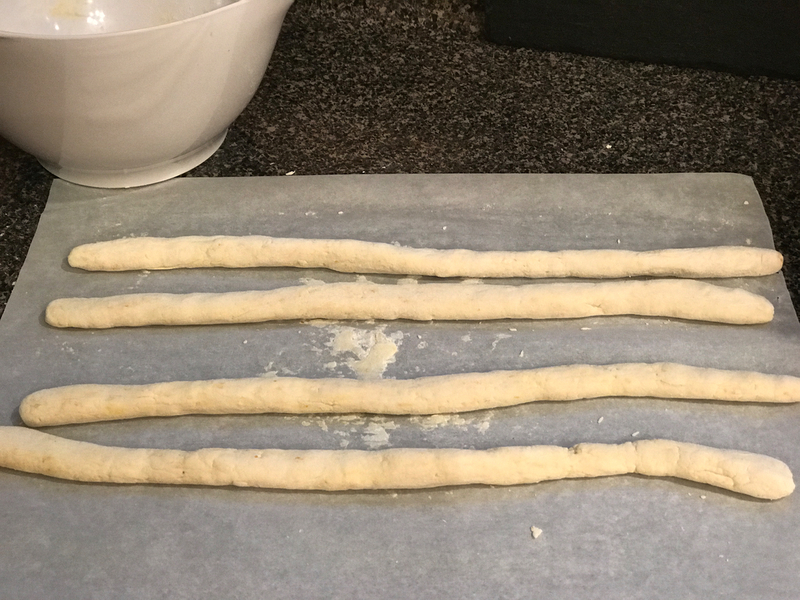 After that, I cut those into ¾ inch pieces with a butter knife. I made this exactly as the recipe called for and, although it was delicious, it seemed to be lacking in some way. 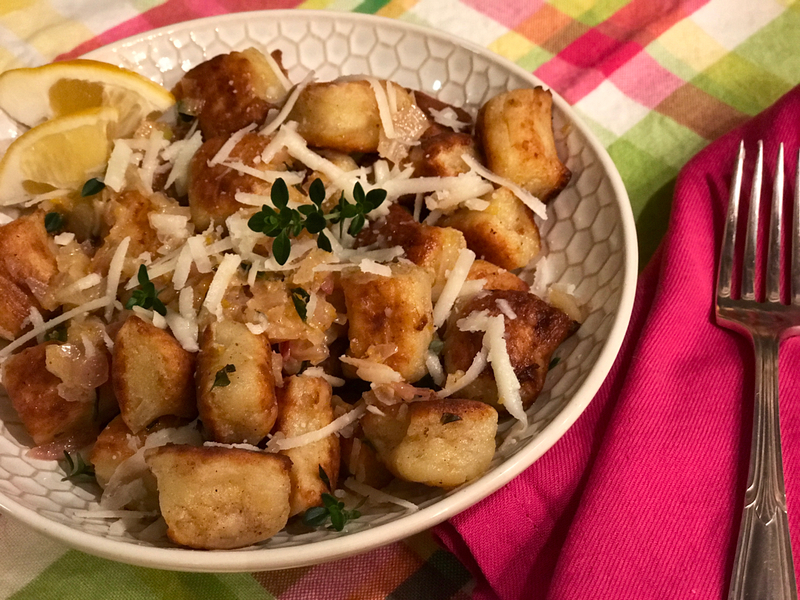 I made it again, adding more lemon zest and some pecorino to the filling, and this time I pan fried the gnocchi instead of boiling … and it was just what the doctor ordered! 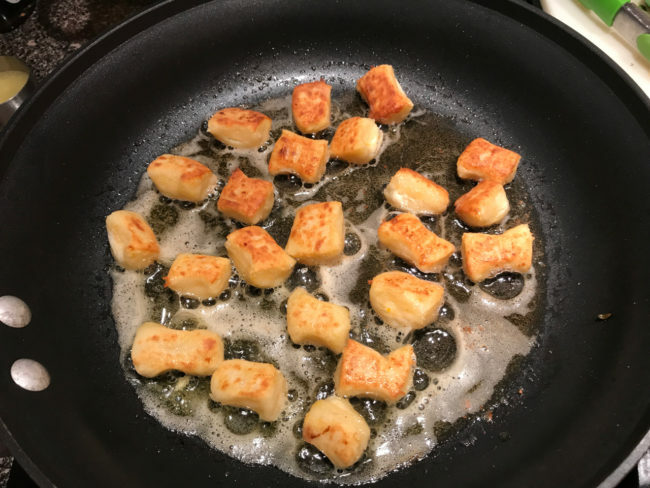 I prefer the caramelized, crunchy gnocchi that you get with pan frying. I include both methods of cooking so you can try it yourself. 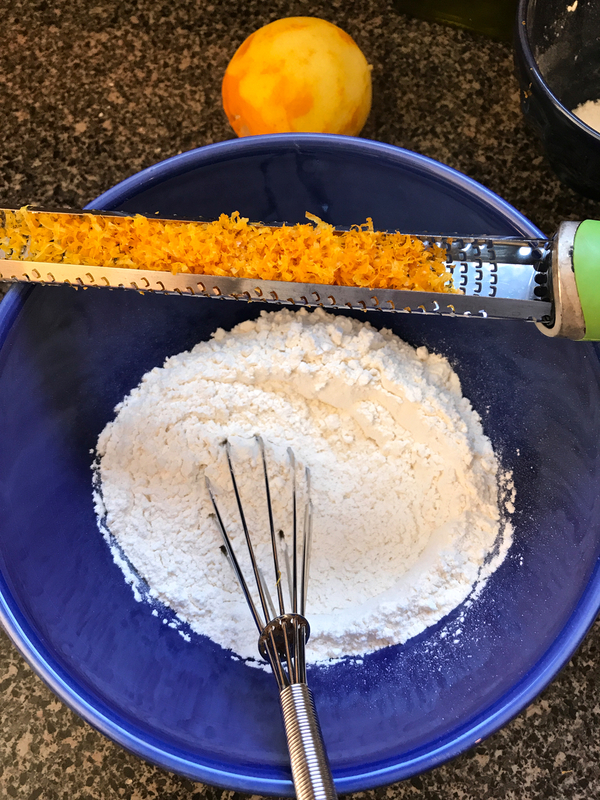 Don’t forget to put a big squeeze of lemon on just before serving to pop that lemon flavor. 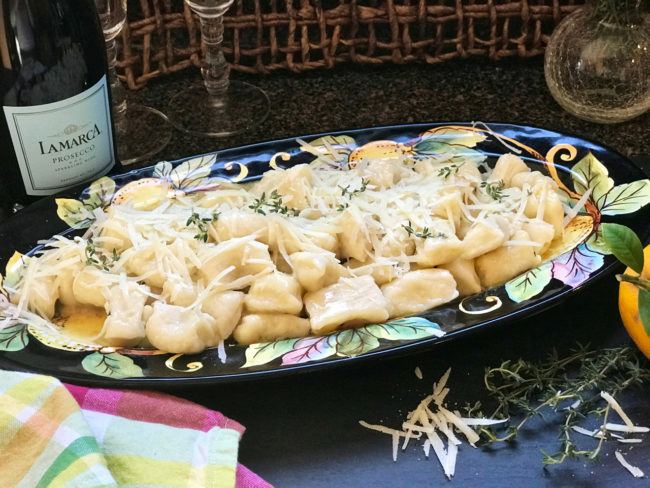 Add a simple salad of arugula, walnuts, and pecorino along with a glass (or three) of Prosecco to transport yourself to sunny Italy! Perfetto! For serving, fresh grated hard Italian cheese of your choice. 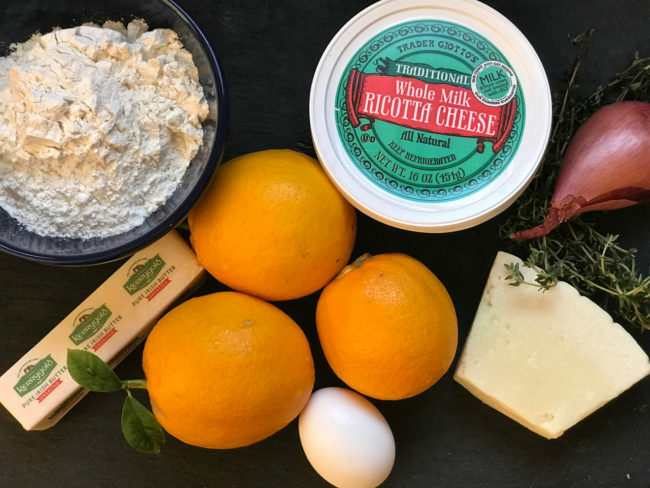 The recipe recommends Parmigiano-Reggiano or Grana Padano; we used Pecorino. Line two large rimmed baking sheets with parchment paper and sprinkle lightly with flour. Lightly dust a work surface with flour. 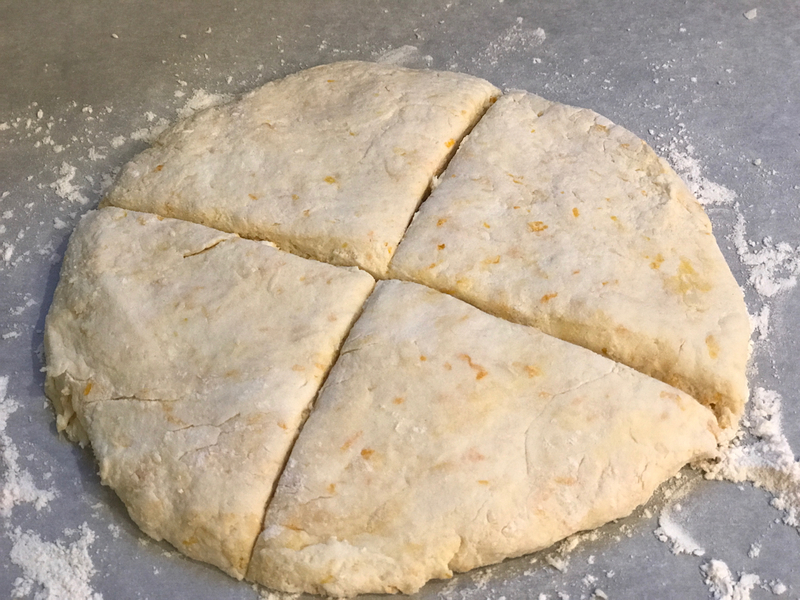 Turn the dough out onto the work surface and work it briefly until soft and smooth, but still a little sticky. Shape into a disc about 1” thick and then divide into four pieces. With your hands, gently roll and lengthen the strips to make a rope about ½ inch in diameter. Cut the rope into ¾ inch pieces either with a pastry cutter or a butter knife. 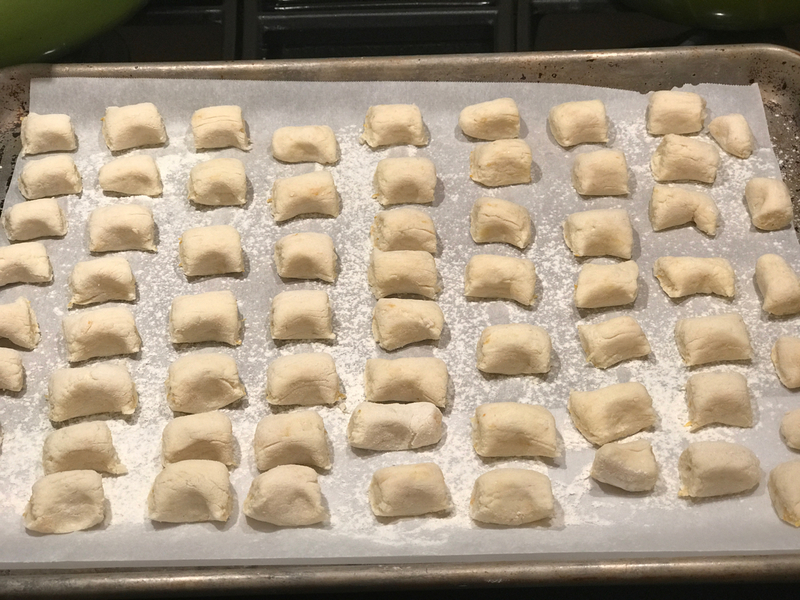 Arrange the gnocchi in a single layer on the prepared baking sheets making sure they don’t touch. Cover with plastic wrap and refrigerate up to 4 hours. If you want to hold them longer, freeze until hard, transfer to a zip-top freezer bag and keep frozen for up to 1 month. Do not defrost before cooking. Melt 2 T. butter in a large skillet over medium heat. Add the shallots and a generous pinch of salt. Cook, occasionally stirring until the shallots are tender and translucent, about 2 minutes. Add 1 T. of lemon juice, the zest from the remaining lemon and thyme. Cook about 30 seconds. If you are pan frying, add the wine and bring to a simmer. 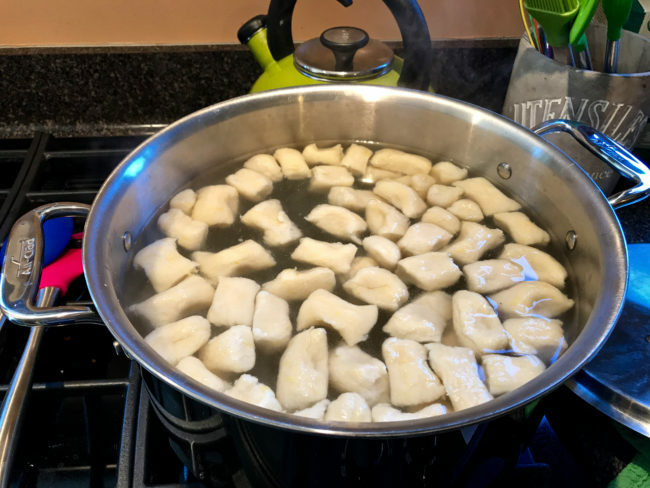 (If you are boiling the gnocchi, see instructions for finishing the sauce below.) Whisk in the remaining 2 T. butter. 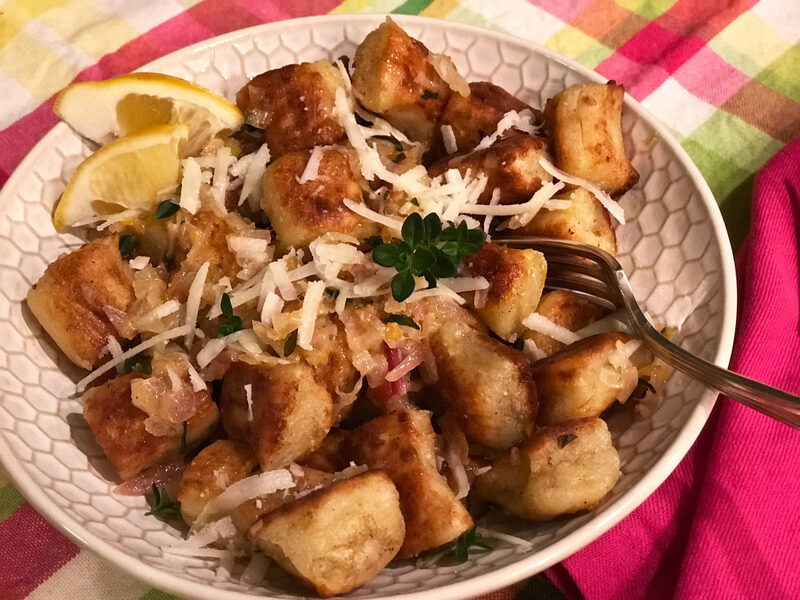 Keep warm while you cook the gnocchi. 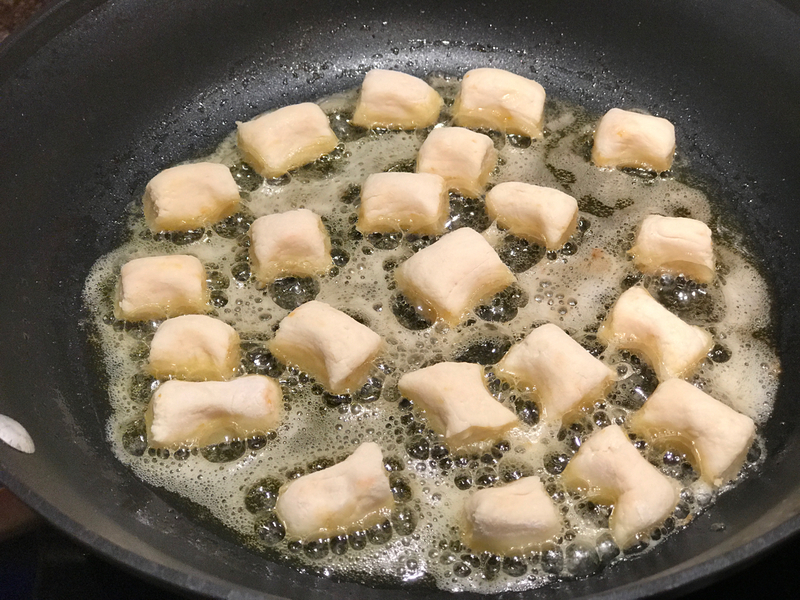 Melt butter and olive oil in a large skillet over medium-high heat. Add the gnocchi in a single layer and fry until golden brown (about 2 minutes per side depending on the size of your gnocchi – carefully taste one to be sure it is cooked). Transfer with a slotted spoon to the shallot sauce and toss gently to coat. Season to taste with salt and fresh ground pepper. Cut the zested lemons into wedges. Serve with more grated cheese and a big squeeze of the lemon wedge. Bring a large pot of well-salted water to a boil. Reduce the water to a simmer and add the gnocchi. Cook, stirring once, until they float to the surface, about 2 to 3 minutes. Remove them immediately when they reach the surface with a slotted spoon. 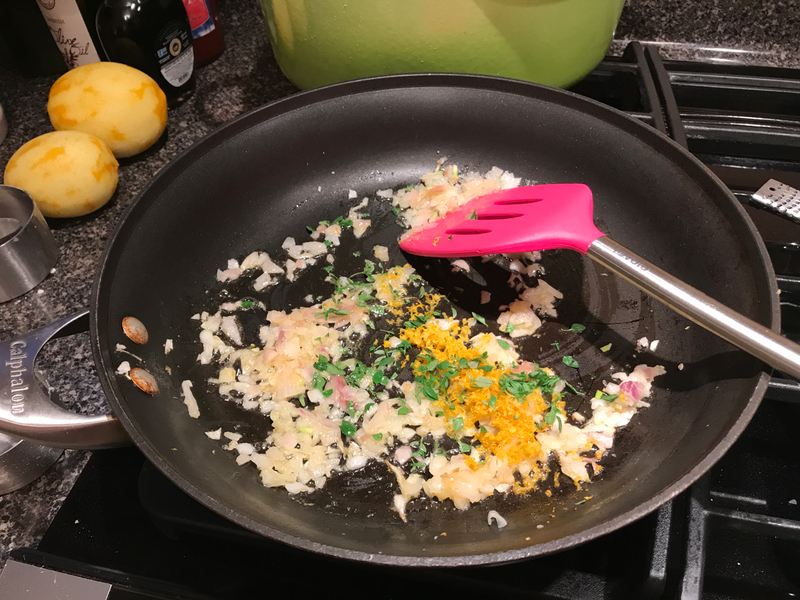 While the gnocchi is cooking, transfer ¼ c. of the starchy cooking water to the skillet with the shallots, lemon, and thyme. Bring to a simmer and whisk in the remaining 2 T. butter. 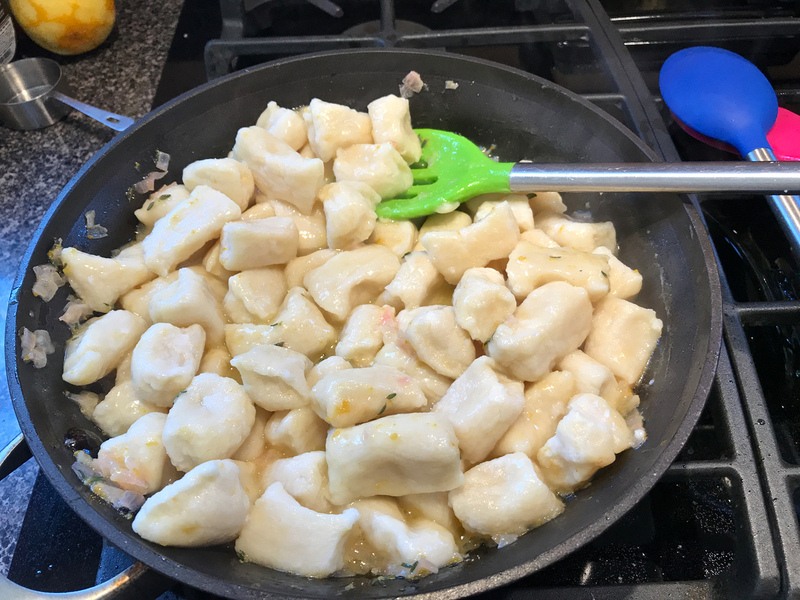 Transfer the cooked gnocchi to the sauce and gently toss to coat. Season to taste with salt and fresh ground pepper. Cut the zested lemons into wedges. Serve with more grated cheese and a big squeeze of the lemon wedge. Serves 4. Recipe adapted from February/March 2018 Fine Cooking.